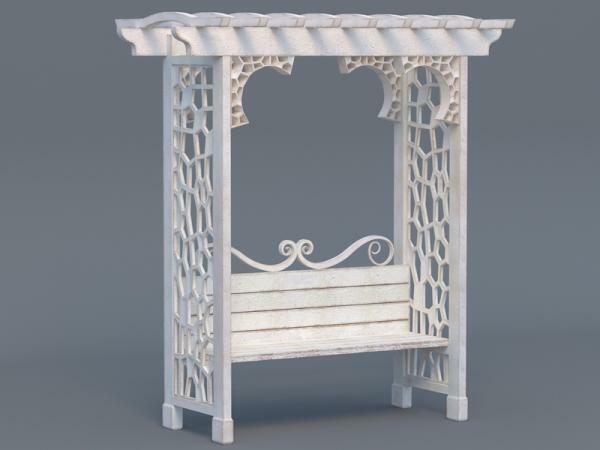 This detailed, garden arbor bench is available as a native 3dsmax 2012 scene file (.max), and also in several scaled .obj formats, for importing easily into other applications, like Blender, Poser, or Daz|Studio. This object comes complete with realistic, high detail texture maps for the color/diffuse and bump material channels. There are several sub-object material zones to this model, which can be accessed individually in your material editor, if needed. The model consists of 19,378 polygons, and 19,292 verts. The object is 99.9% quad polygons, with a mere 12 triangles on the entire mesh. Each texture map is provided in maximum quality JPG format, with resolution of 2048x2048 pixels, and are suitable for close-up rendering. You may need to tweak or adjust the power of the bump maps in your software of choice, to get the optimum results for rendering. This model has been evaluated with Check-Mate Lite, and passes all scene property testing, with no potential problems. It is not Check-Mate Pro certified, but is compliant with all requirements. *All preview renders were made with the Octane render engine, using the exact maps that are included with the model. Please review the special instructions for OBJ import. Thank You So Much This Is Beautiful. A lovely garden feature ! Wonderful ... Thank You very much Luxxeon ! Thanks, for another excellent model. What a gorgeous bench. Thank you. mdamlady (5 years ago) Inappropriate? What a wonderful model. Thank you very much! Thank you :) Fantastic model! Bailey48 (5 years ago) Inappropriate? Windigo (5 years ago) Inappropriate? Quality and Excellence = Luxxeon!!!! Humble thanks!